Even though your fling in Monaco can (and should) be divinely decadent, I’ve found ways to both splurge and save. Café de Paris, the landmark Belle Époque brasserie, across from the casino, is the place for a chic rendezvous from breakfast to the wee hours. Indulge in one of their outrageous gelato confections. I recommend the Peach Melba or Banana Royale. If you really want to fit in, tote a poodle in a Louis Vuitton case and wear matching designer shades. 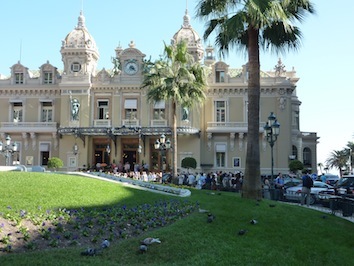 Even if you’re not a gambler, you must spend some people-watching time at the Monte Carlo casino, another Belle Époque wedding cake of a building created by architect Charles Garnier (who also built the Paris Opera House). You might not spot James Bond but there will be no lack of designer-clad glamour girls and tanned playboys. Entrance is €10, plus your passport. Just 18€ buys a double ticket for the Prince’s Palace and the Oceanographic Museum. Start in Le Rocher, the medieval heart of Monaco where narrow streets lead up to the Grimaldi Palace. A self- guided audio tour leads you through splendidly furnished suites, including a stately Throne room where there’s a lovely painting of the late Princess Grace, Prince Rainier and family. At the Oceanographic Museum you’ll have the added bonus of viewing the Giorgio Armani-designed wedding gown and photos from the lavish matrimony last July of Prince Albert II and South African, Charlene Wittstock. The museum and its research organization were headed by Jacques Cousteau until 1997. Rare fish swim in 90 glass aquariums and there’s a new shark lagoon where those creatures lurk amongst the coral reefs. The best deal in town is the one-day pass (€3) for unlimited travel on all of Monaco’s bus routes. 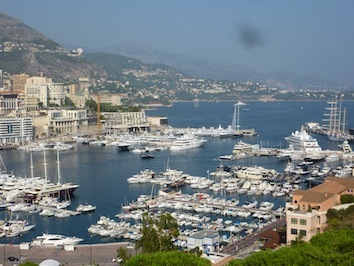 By taking them you’ll have a complete tour of the highs and lows of the Principality, plus mingle with the locals, called Monegasques, The pass is also good for the shuttle boat that goes from one side of the port to the other so you can have a close-up peek at the mega-yachts moored in the harbour. Take the number six Fontvielle/Lavarotto bus to Monaco’s best beach and bask with the beautiful. I like La Piazza (9 rue de Portier), a five-minute walk from The Fairmont. Sit inside or out on the terrace and enjoy friendly, unpretentious service (these waiters did not go to snob school) and traditional Italian food. Their homemade lasagna is excellent, as are fish dishes.